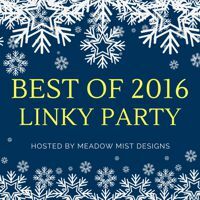 Hi and welcome to my stop on the Best of 2016 blog linky party! I had such fun going through my posts from the year to figure out which 5 posts I would be highlighting today. It was a great way for me to review the year and revisit some finishes from earlier in the year that I had forgotten about. I picked my top 5 posts by the posts with the most views (minus any giveaway posts). Click on any of the titles to be taken to the actual blog post for more information and pictures. 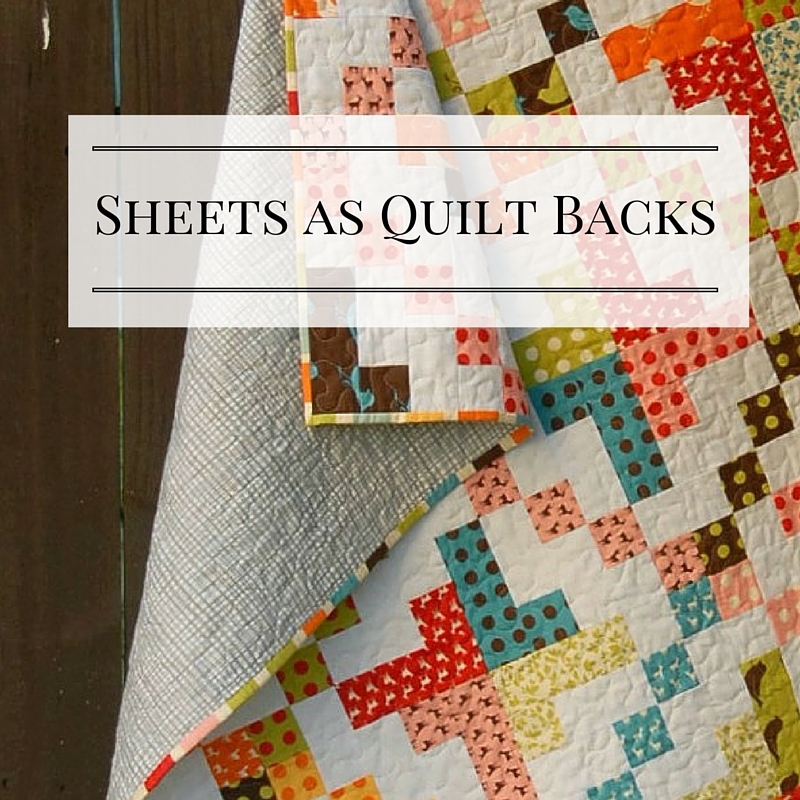 My post about using sheets as quilt backings (and tips for successful sheet selection) was my #1 most viewed post ever with over 14,000 views! If you hop over to that post, be sure to read the comments as the quilters that commented added a lot of knowledge and value to the topic. 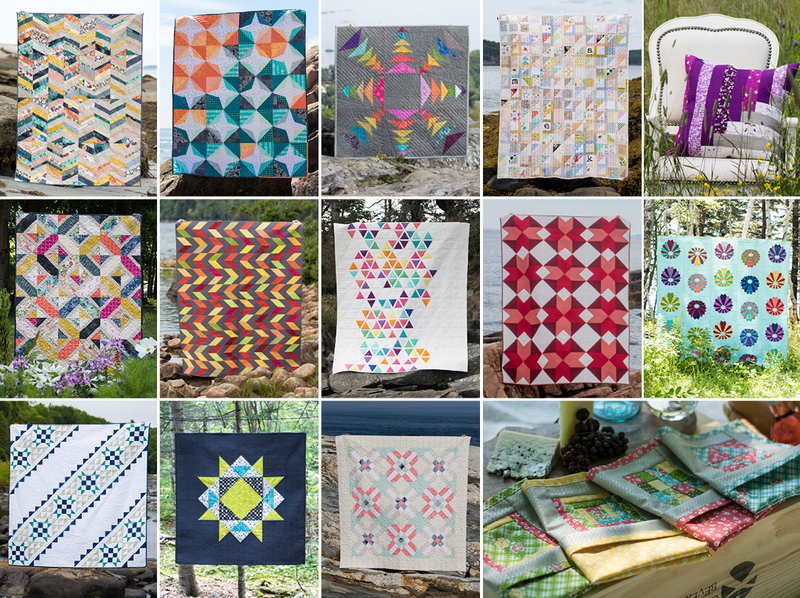 The Midnight Mystery Quilt posts have also been very popular, especially the quilt reveal parade post which has over 100 versions of the quilt! (You can see the parade right here). The instruction posts will always be available on my blog so you can start anytime! I designed Canvas Lines with a slight tribal feel with alternating diagonal geometric shapes and negative space. Canvas Lines combined some of the prints from the Doe collection by Carolyn Friedlander for Robert Kaufman with some crisp Kona white fabric. The Canvas Lines quilt and pattern are available in the Quilter's Planner (and my plan is to release a full pattern including baby, lap, and queen sizes early next year). 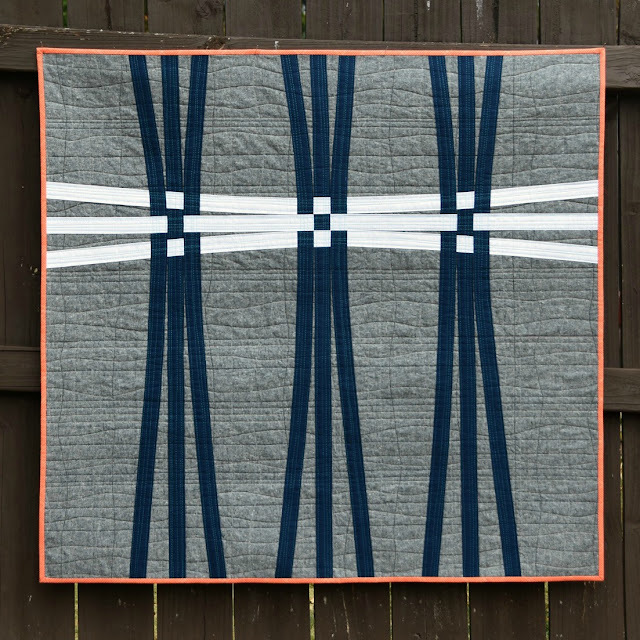 I made the Kiku quilt for the Quilts from 100 Blocks Magazine Fall 2016 edition from my block Cloud Burst which was a paper pieced block design. In Kiku I enlarged the block, added partial blocks on either side to finish off the secondary patterns, and added a bunch of negative space. 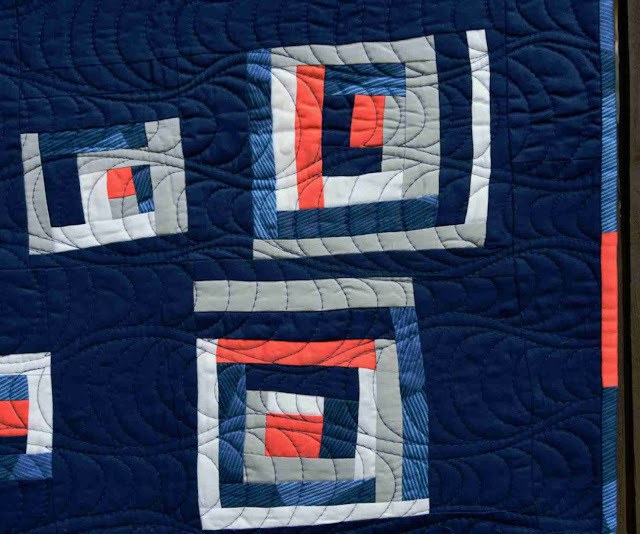 Johellen George quilted a pattern of double swirls on the quilt. I just found out that the quilt was accepted into QuiltCon in the piecing category (under the original quilt name Cloud Burst). Thanks for stopping by my blog! I hope you will consider linking up your favorite posts from 2016! You can visit the Best of post right here. 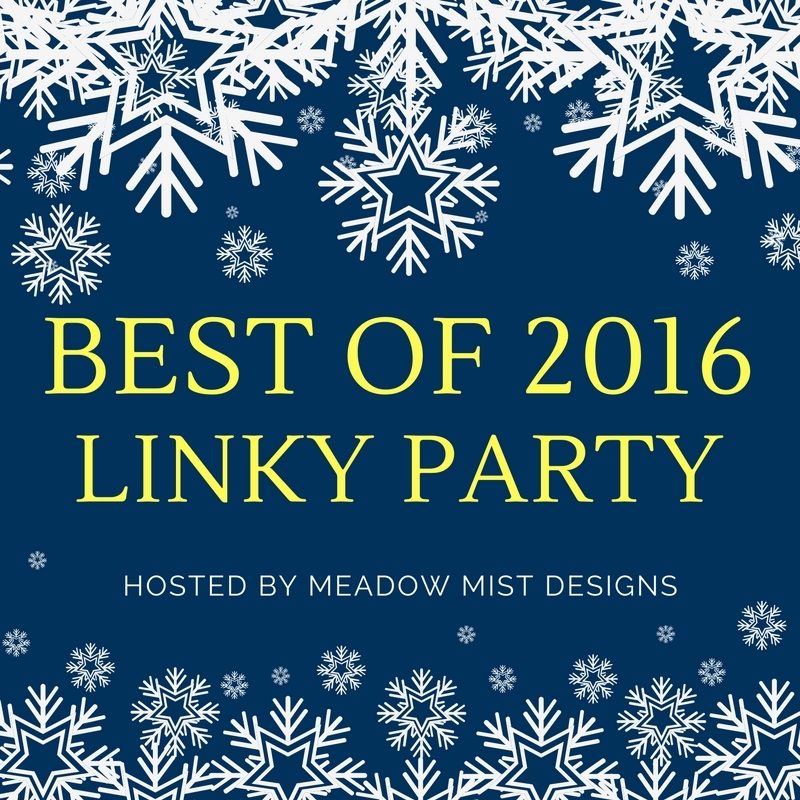 Welcome to the Best of 2016 Linky Party! This is the second annual "Best of" blog party to share your and read others top 5 posts of 2016. The link party is open now and will remain open for 1 week, closing on Monday, January 2nd. This month for the Meadow Mystery Quilt we made pieced some of our units into blocks making Blocks 1, 3, and 4. The Facebook group so full of some wonderful versions. If you want to join in, it is not too late! 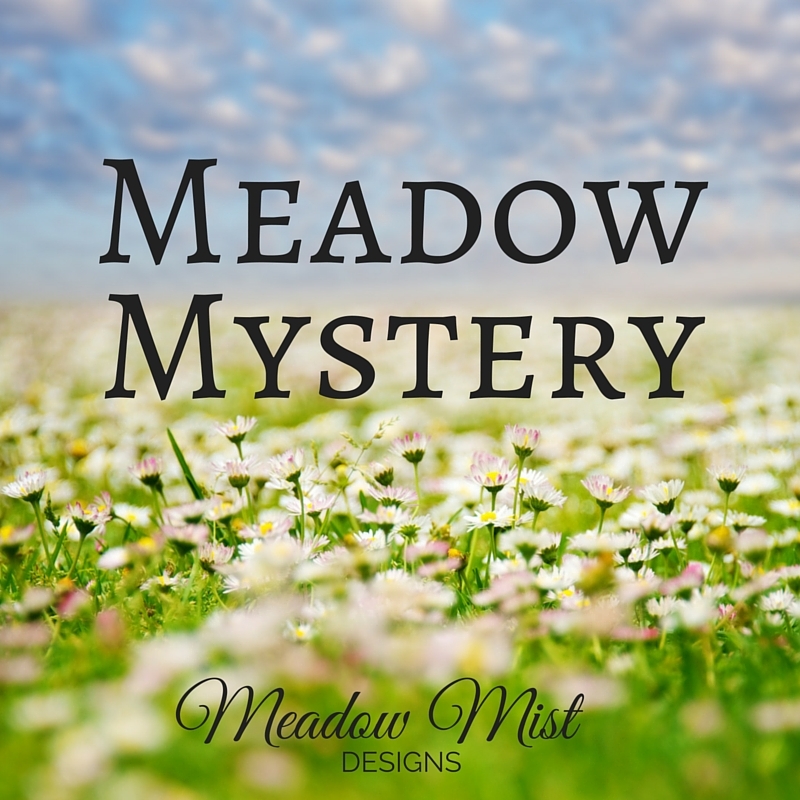 I am making two versions of the Meadow Mystery Quilt, a more traditional version using Gentle Breezes by Maywood Studio and a more modern version using some of my favorite text prints. I once again only have the Modern Text blocks to share today (I am hoping to get caught up on the traditional version in January). The instructions are given out on the first Thursday of every month so the next set of instructions will be posted on the blog on Thursday, January 5th. I can't believe that 2016 is almost gone! It seems like it was just Halloween and yet we are just a few days away from Christmas. My wonderful bloggy friend Yvonne, who blogs are Quilting Jetgirl, hosts an annual planning party to layout goals for the upcoming year. I thought that I would use this post to first go back to my 2016 goals to see if I had actually accomplished them and then post my 2017 goals. Done - I made 5! I posted the huge Pattern Writing Workshop, tips for using sheets as backings, and a tutorial for my Cloud9 blog hop blog. So not quite 4 but pretty decent. In 2016, I have gotten better at saying no to opportunities (and at least taking a few minutes to think about them before saying yes). But my balance between quilting for "work" versus fun has been off these last few months and hopefully I will be able to get that back on track for 2017. I think that I made good progress towards my big picture 2016 goals, these are continuous improvement goals so they will never be done and I would like to carry these over to 2017. Thank you so much Yvonne for hosting such a fun linky party. Please take a minute to hop over to her blog and visit everyone else's 2017 Planning Links. I hope that you will consider writing a post and linking up to the Best of 2016 Linky Party on this blog the day after Christmas (you can find out more info right here). 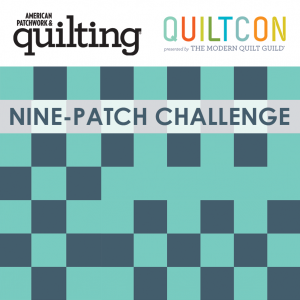 Today I would like to show my APQ Nine-Patch Challenge Quilt I have named Warp and Weft and take you through its design and production process. I had heard about the Nine-Patch Challenge in mid summer and knew I wanted to take part but really did not have a good idea for the quilt. 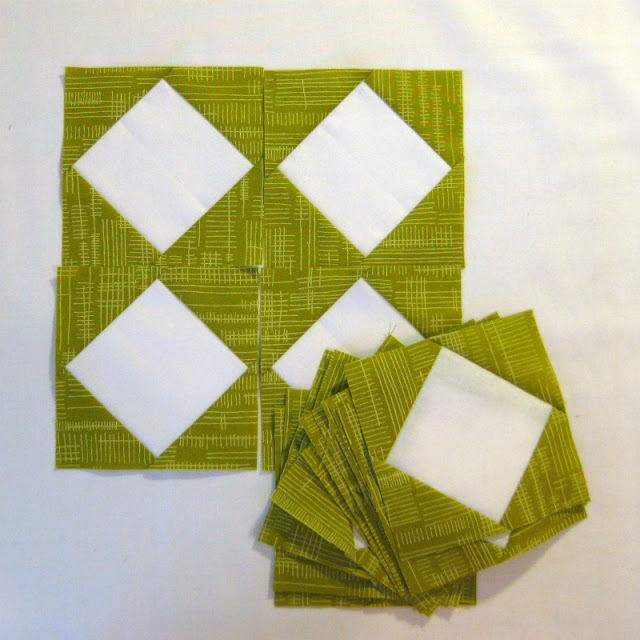 The requirements were that you had to modernize the 9-patch somehow and could make any size quilt and use any fabrics. In October, I was at work drafting a new patent application on a woven fabric (I write patents for a private industrial textile and chemical company). The fabric was similar to a shot cotton where the warp yarns (that go along the machine direction) and the weft yarns (that go perpendicular to the machine direction) were different yarns and I noticed that it kind of looked like a 9 patch. Thus my woven 9-patch idea was born. I thought that it would be good to use some Essex Yarn Dyed Fabric in black as my background as it has great texture and also has different warp and weft yarns. I made a quilt sandwich with it and started quilting straight lines. 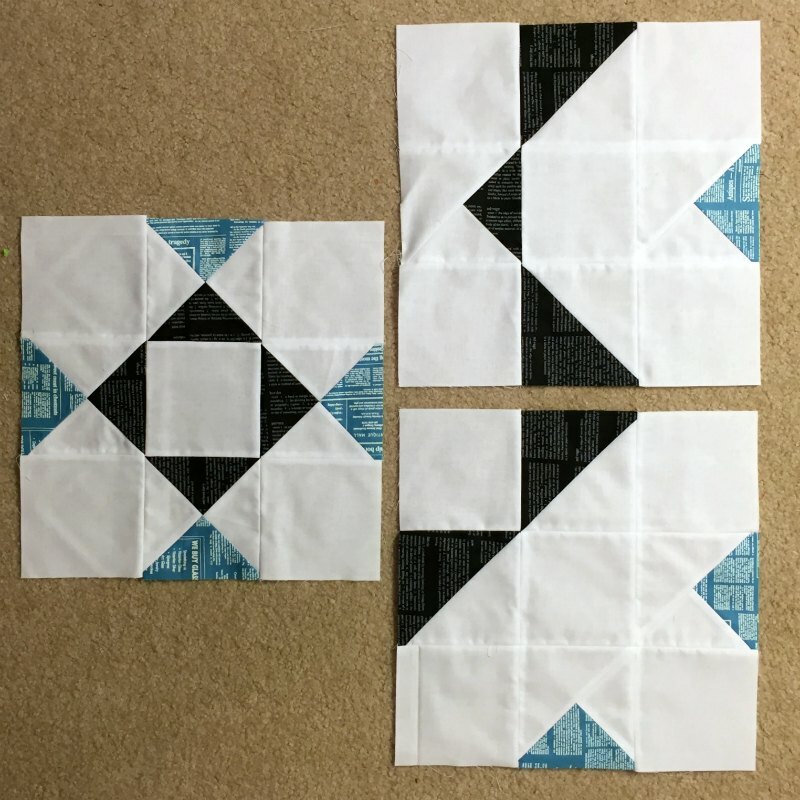 I was using whites, grays, and blacks of Aurifil in 50wt but it was difficult to see the quilting and it was not giving me the effect I was looking for. So I switched to 40 wt Aurifil in gentle organic lines which showed up much better against the Essex linen. After quilting I blocked the quilt to make sure that it was nice and flat for the woven strips. To make the woven strips, I sewed 2 1/2" x width of fabric pieces in half to make a slightly less than 1" strips (which happened to fit perfectly on my metal yard stick which made ironing the strips a lot easier). I played around with many different layouts of the strips and have to thank Paige for giving me so much feedback (and for putting up with me texting different pics every few minutes). I settled on the center strips forming a true 9-patch with the patches on the sides looking to be unraveling. I used Heat and Bond Lite to attach the strips to the quilt and the plan was that I would hand stitch down the strips while on vacation over Thanksgiving. Just to hold everything in place I basted the strips on using some turquoise thread at the max stitch length of my machine. When I finished the basting stitches I really liked the look of the turquoise stitching on the strips so I added some more lines to each strip (which also had the added benefit of eliminating the need to hand stitch the strips down). 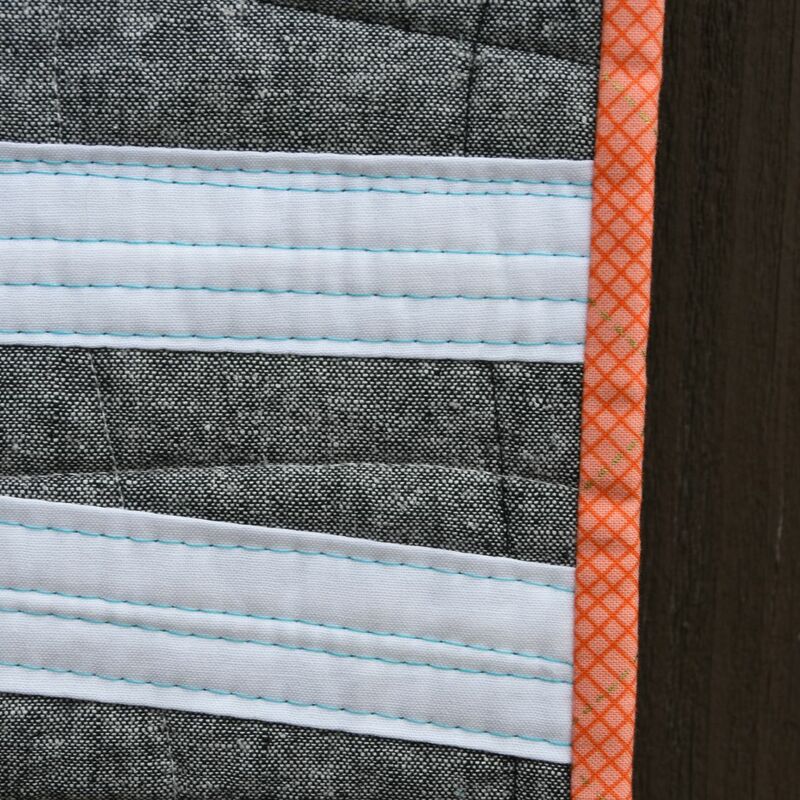 For a binding, I auditioned a bunch of options and had first picked a turquoise to match the quilting thread. I decided that this quilt needed some more pop so I used an orange plaid fabric from Carolyn Friedlander that had some metallic printing. 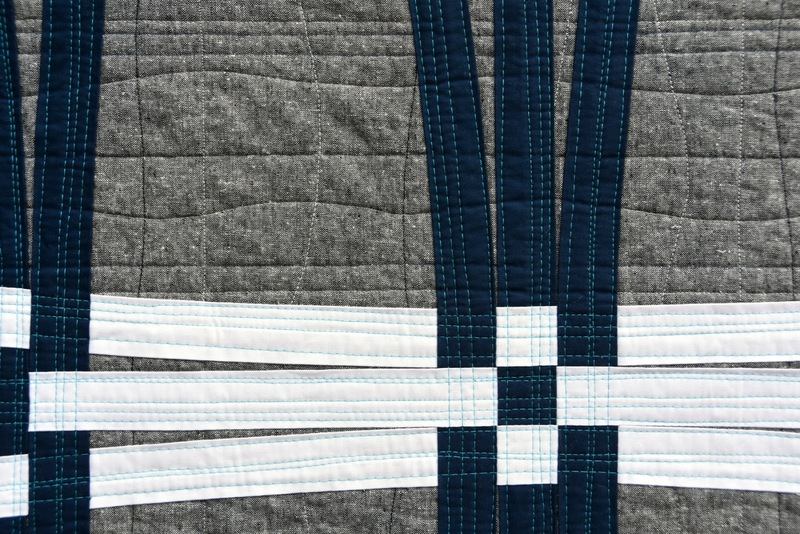 I think that the binding is actually my favorite part of the quilt. So Warp and Weft was finally complete and finished at about 41" x 42". I am linking up to Whoop Whoop Friday, Thank Goodness Its Finished Friday, Finish It Up Friday, Fabric Frenzy Friday, and Show Off Saturday @ Sew Can She. I am happy to show off my entry for the Michael Miller QuiltCon 2017 Challenge today, which I am calling Air on Strings. 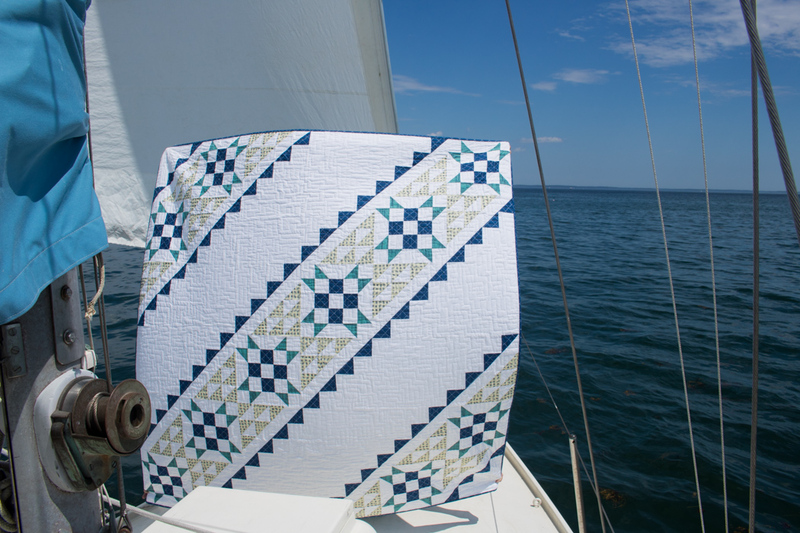 The challenge was to use Michael Miller’s new Luxe collection of superior 108″ cotton fabrics. The rules were to use at least two fabrics from the Luxe line (one solid and one printed). We could also use one coordinating Michael Miller solid. I made this mini to break up some of the longer term, secret sewing I have having to do recently. I have been doing a lot of paper piecing recently, so when I had a chance to take a break from that I went in the completely opposite direction with some improv sewing. 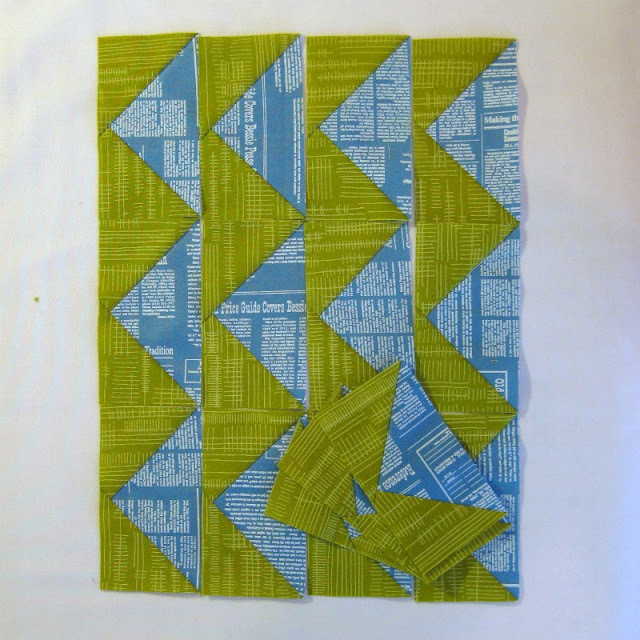 I gave myself a time limit to make the blocks, grabbed my fabric and started cutting. I made the quilt top without a ruler until I squared it up for binding. It was fun to see the blocks start to come together in their imperfect, wonkiness. Due to time and fabric constraints, my quilt finished up at about 18" x 21". 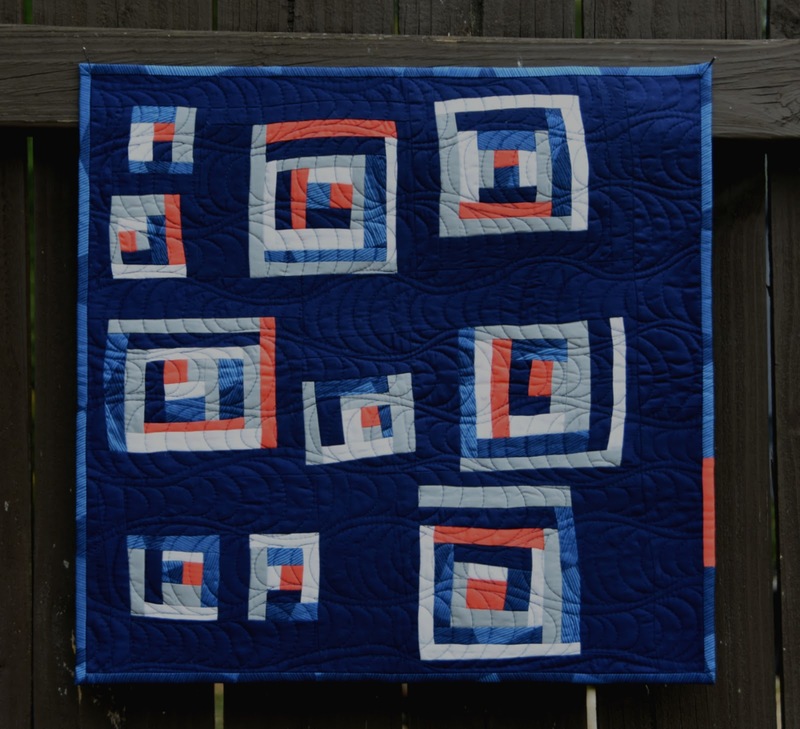 I quilted it using Angela Walter's signature design in a dark blue Aurifil thread (in 50wt) so that the quilting would blend in with the background. 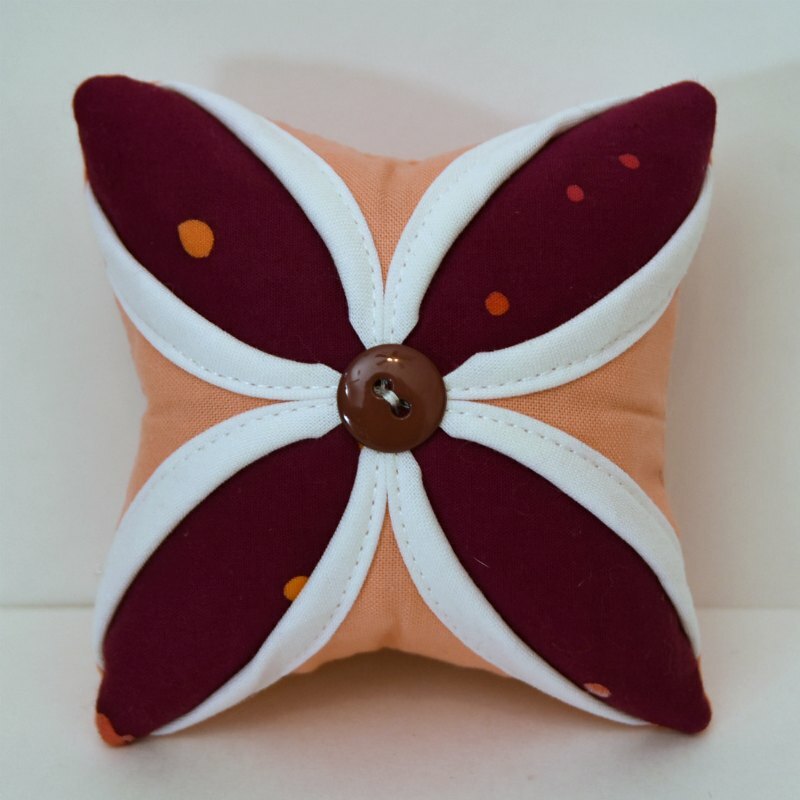 I bound the mini in some more of the Luxe fabrics with a little bit of orange pieced in. Sew Mama Sew Giveaway Day 2016! So who would like to win not one but two shot-cotton rainbow jelly rolls? 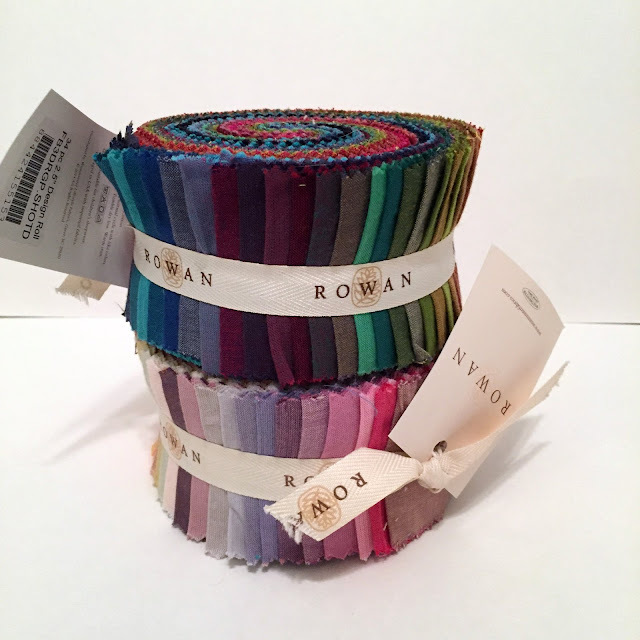 The jelly rolls are by Rowan with one being rainbow of lighter colors and one being a rainbow of darker colors. 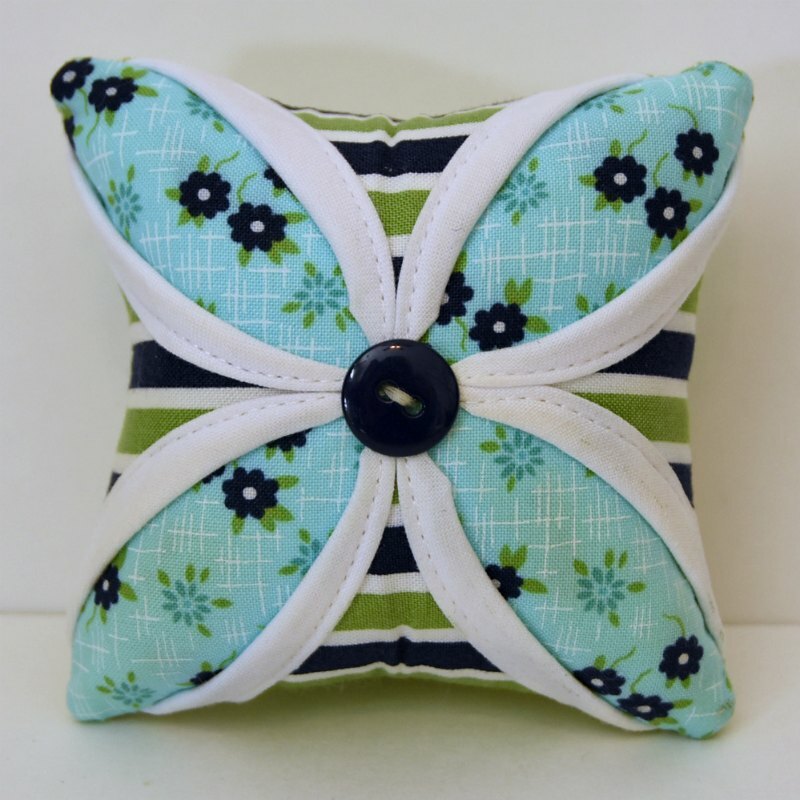 This is my fifth time participating in the Sew Mama Sew Giveaway Day. 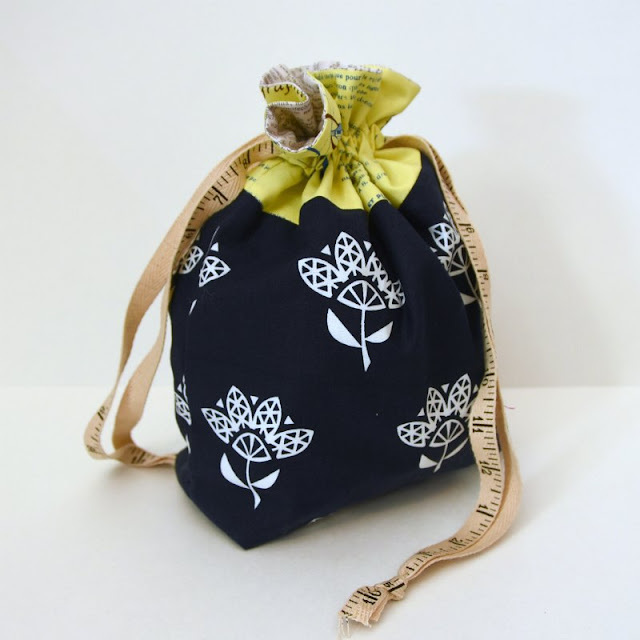 I love Sew Mama Sew and I enjoy spending a few many, many hours entering giveaways and finding new wonderful blogs each SMS Giveaway Day. My name is Cheryl and I am a chemical engineer/patent agent by day and a quilter at night. I have a wonderfully supportive husband who allowed me to turn the guest bedroom into my quilting room, a 9 year old son and 6 year old daughter. I love designing quilt patterns and doing quilty math which allows me to combine my quilting skills with my engineering and technical writing backgrounds. The Meadow Mystery Quilt, my third and most recent mystery quilt-along which started in July and will wrap up in April. Instructions are posted monthly so there is plenty of time to join in and catch up! In the beginning of 2016, I presented a blog series called the Pattern Writing Blog Series. 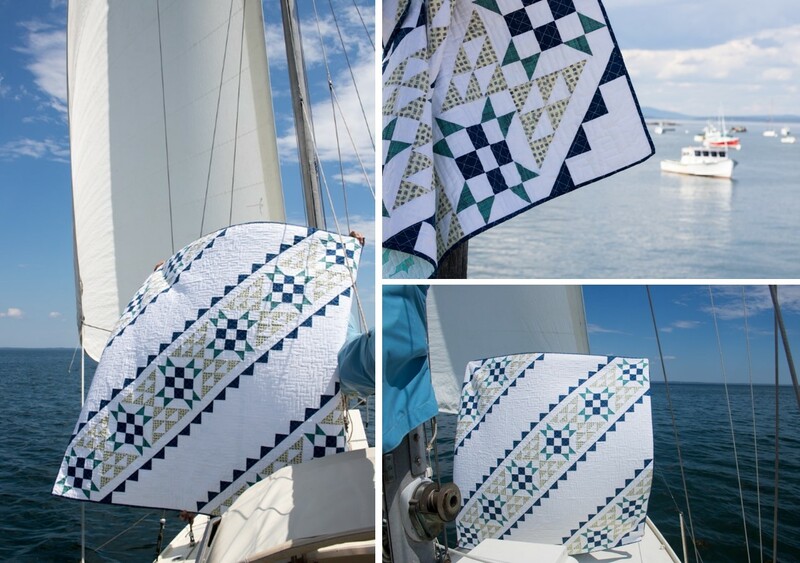 The 16-part series taught how to take a quilt design from a sketch book to a fully developed quilt pattern, demonstrating each step and concept using an actual quilt pattern example. 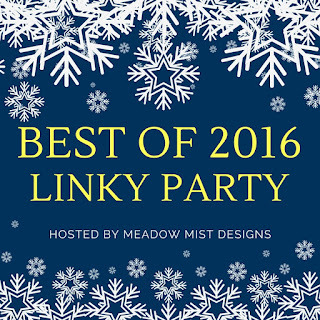 Best of 2016 Linky Party will be starting the day after Christmas (Monday. Dec 26th) and continue through Jan 2nd. Simply write a new blog post highlighting your "best" 5 posts from 2016 and linkup. There is no set way or rules to pick your best, you can pick and highlight your posts anyway you would like. Here are some of my favorite finishes of 2016, you can see all of my finishes here. 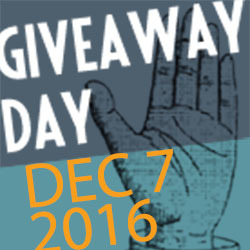 This giveaway starts today, Wednesday Dec 7th, and will run until Sunday Dec 11th at 8 p.m. EST. 1. Leave a comment, any comment. If you would like a topic, I would love to know the size of quilt you make most often. Best of 2016 Link Party Coming Soon! It is no secret that I love blog link parties. 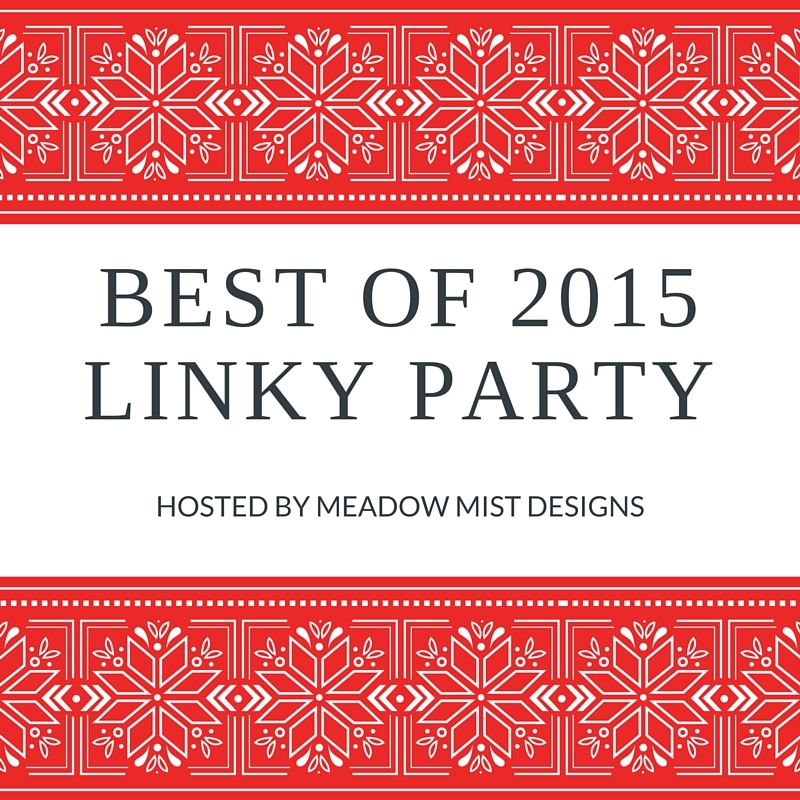 One of the main reasons I started my blog was so that I could take part in the sharing of knowledge and inspiration through the parties and so I am very excited to announce that I am hosting my second annual blog linky party, the Best of 2016 Linky Party! You can also go through the Best of 2015 posts here. The link party will open the day after Christmas, Monday December 26th and will be open for 1 week ending on Monday, January 2nd. I am very happy to link up with Main Crush Monday @ Cooking Up Quilts, Fabric Tuesday @ Quilt Story, and Let's Bee Social @ Sew Fresh Quilts. 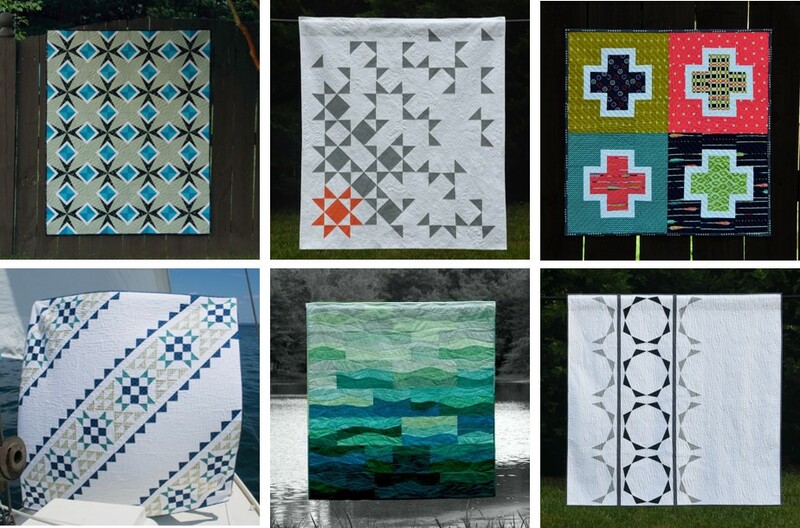 Welcome to the December instructions for the Meadow Mystery Quilt! If you just found this mystery quilt, there is still plenty of time to join in and catch up! 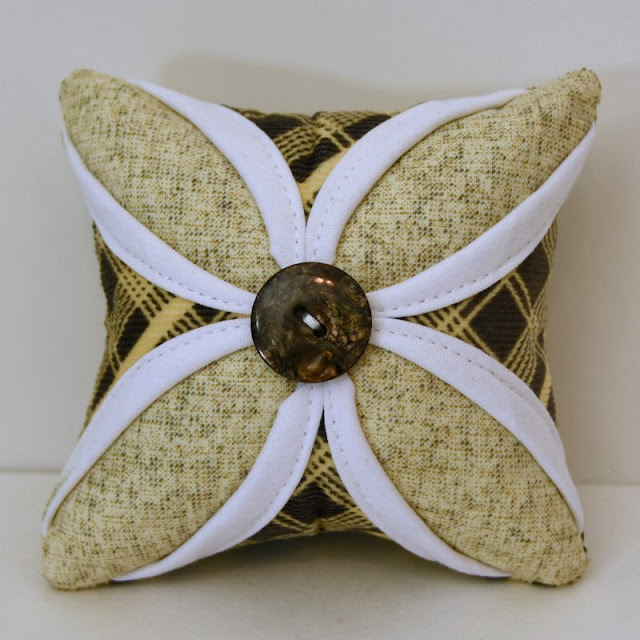 Arrange and sew the following fabric pieces as listed and shown below, pressing all seams open. Block 1 should measure 12 ½” x 12 ½”. Make 1 block. Arrange sew the following fabric pieces as listed and shown below, pressing all seams open. Block 3 should measure 12 ½” x 12 ½”. Repeat to form a total of 4 blocks. 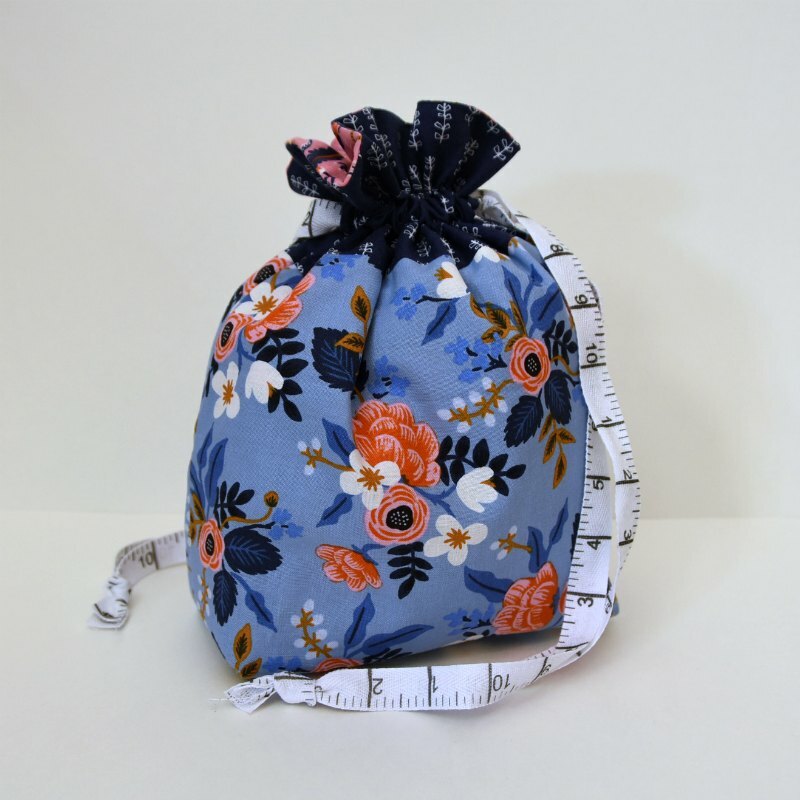 Arrange and sew the following fabric pieces as listed and shown below, pressing all seams open. Block 4 should measure 12 ½” x 12 ½”. Repeat to form a total of 4 blocks. This month for the Meadow Mystery Quilt we made some flying geese and square in a square units. The Facebook group so full of some wonderful versions. If you want to join in, it is not too late! 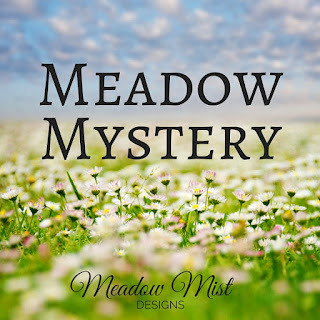 I am making two versions of the Meadow Mystery Quilt, a more traditional version using Gentle Breezes by Maywood Studio and a more modern version using some of my favorite text prints. I once again only have the Modern Text units to share today. The instructions are given out on the first Thursday of every month so the next set of instructions will be posted on the blog in just a few days on Thursday, December 1st. 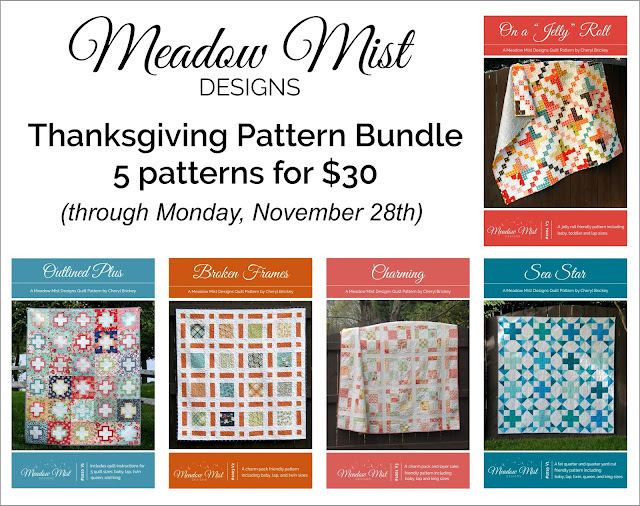 Just a little reminder that my limited-time pattern bundle of Meadow Mist Designs patterns on Etsy will end at midnight tonight. The bundle contains five (5) of my most popular patterns in both digital and printed versions for only $30 (a $50 value). You can find the Digital Bundle here and the Print Bundle here. 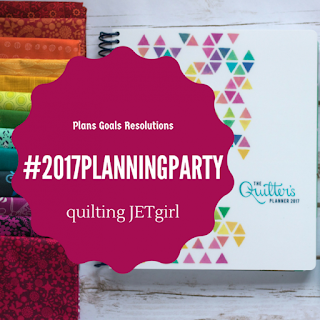 As I recover from my Thanksgiving dinner yesterday and do some Black Friday shopping today, I am also starting to plan out and organize the start of next year by starting to fill in my new 2017 Quilter's Planner. I just love to start writing in a new planner, it is like a new blank slate for a new year. This year's planner is even better than last years! 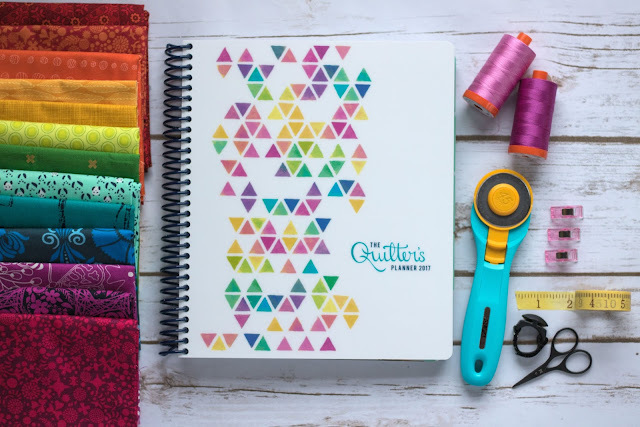 The cover and tabs are more durable, the photography is amazing and there are more project sheets included to keep your on going and planned quilting projects organized. 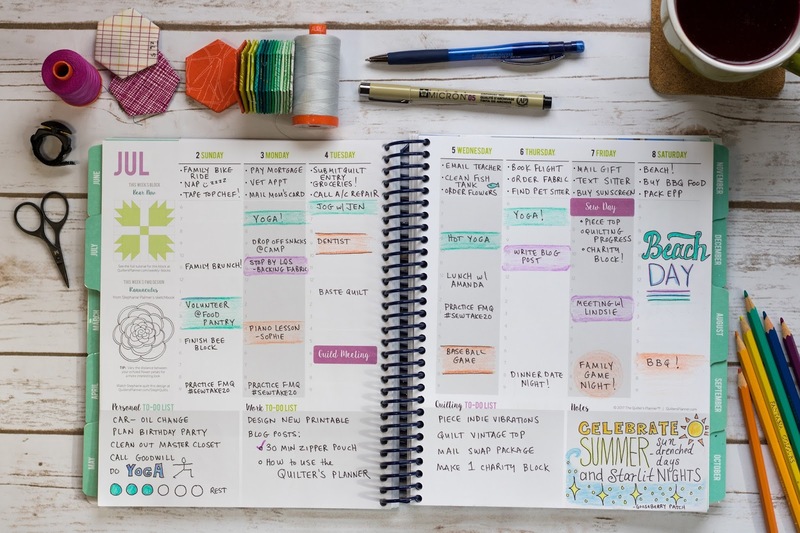 I utilized my 2016 Quilter's Planner extensively, using the monthly spreads to organize my family, quilting, and work schedules and plan out my blog posts. I used the weekly spreads for to-do lists and due date reminders. My pages definitively did not look as beautiful and stylish as Stephanie's below but they really got the job done. My quilt pattern Canvas Lines is one of the quilt patterns included in the planner. The Quilter's Planner is available to from Stephanie's online store: The Quilter's Planner. To receive planners by Christmas or Hanukkah, orders need to be placed by December 10th. To receive orders by the New Year, orders need to be placed by December 20th. In my local modern quilt guide, the Greenville Modern Quilt Guide, we recently held elections and voted in a new president. I was the president for the last two years and was the vice-president for two years before that. We are a new guide so we did not have much money to bring in speakers and therefore relied on our own members for our content. I am in awe of the talent that we have in our group and so grateful for them to have shared their talents and their time for our guide. I made each member that contributed to the group that held a chair position and/or presented a presentation, tutorial, or workshop. 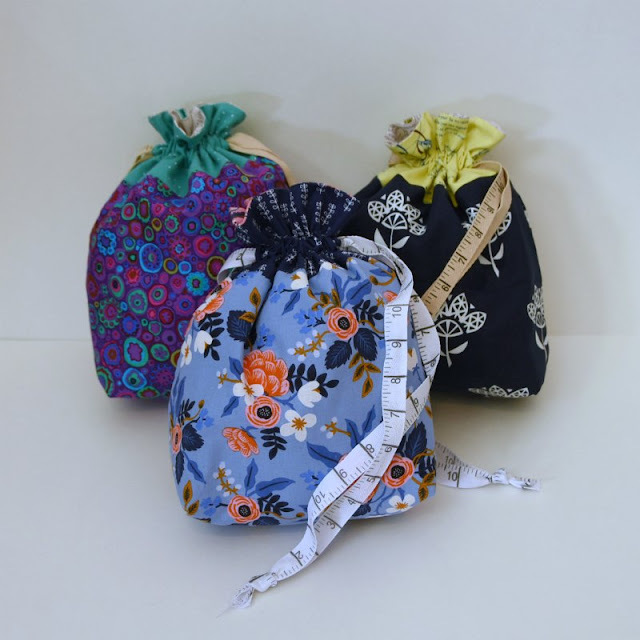 I shared four mini quilts that I gifted last week and today I would like share some drawstring bags and pincushions I made for some members. 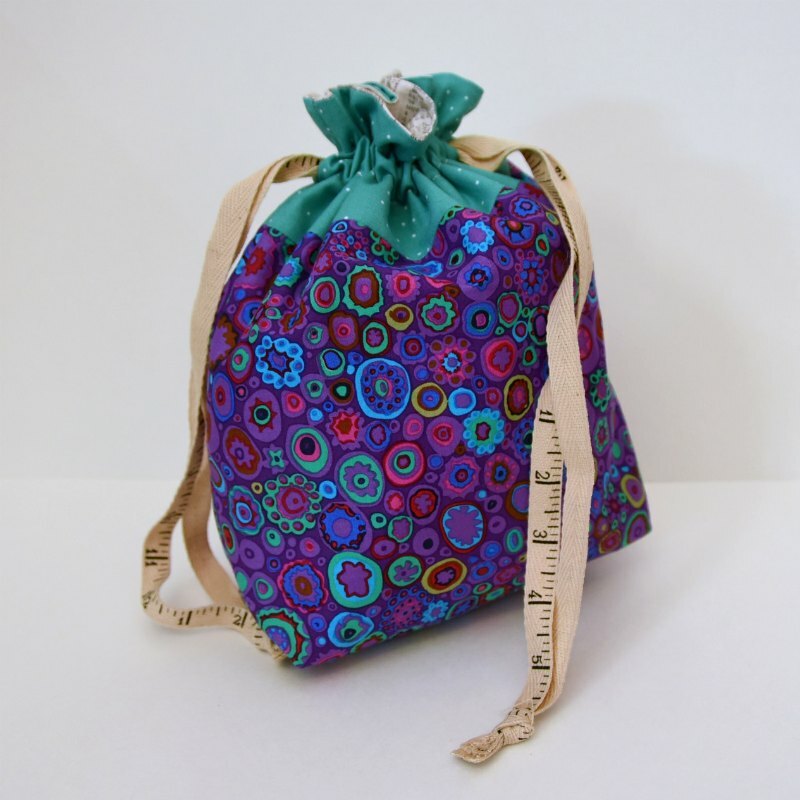 For the drawstring bags, I used Jeni Baker from In Color Order's Lined Drawstring Bag Tutorial and customized each bag for the recipient. Drawstring Bag 1 - For our incoming president who taught a quilting workshop and presented a trunk show (and who I know loves this blue print by Rifle & Co. for Cotton & Steel). Drawstring Bag 2 - For our treasurer who also organized and hosted the guild challenge, a Cotton & Steel version. The yellow fabric is a Japanese print that is all about handwriting to go along with the theme of her guild challenge piece. Drawstring Bag 3 - For one of our board members who lead the creation of the by-laws and co-organized our one year anniversary pattern, a Kaffe Fassett bag. All of the bags together. I also made 4 pincushions for other members who have contributed to the guild. 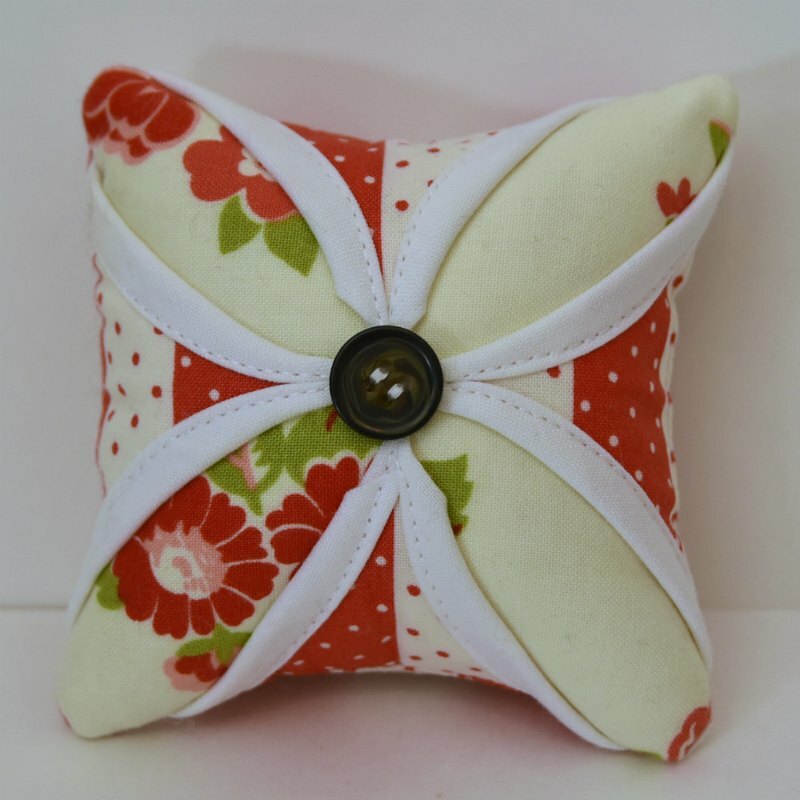 Since I stopped selling pincushions in my Etsy shop I have actually missed making them so these were fun to sew up. I hope you enjoyed seeing these little gifts! Have a wonderful weekend!